Update: L'Atelier was awarded 2 Michelin Stars in the inaugural Michelin Guide for Singapore in 2016. It was a Friday evening for which we had no prior plans or reservations. I had expected to work late (as indeed I did, relatively speaking) and at 6pm decided to see if we could get a table at L'Atelier. 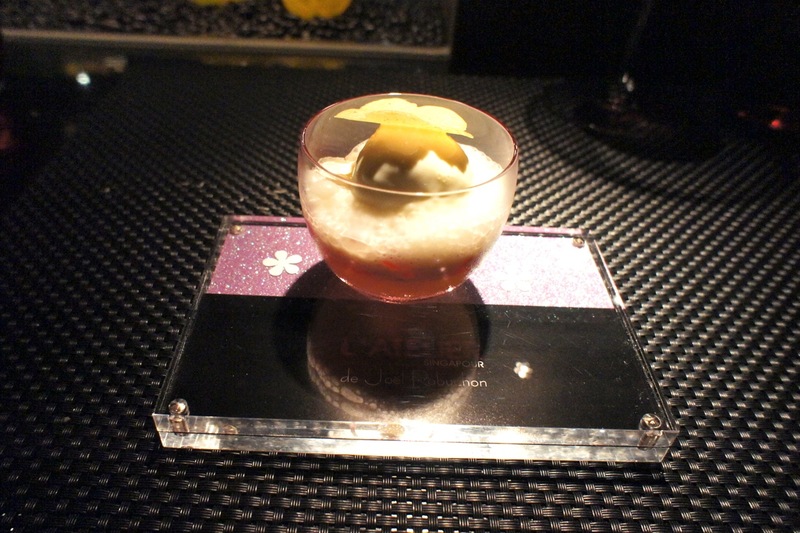 We had dined at the L'Atelier in Hong Kong and Tokyo, but had always preferred Robuchon's more formal restaurants like Le Jardin de Joel Robuchon in HK, Robuchon a Galera in Macau and Joel Robuchon in Singapore, mainly because we didn't enjoy sitting by the counter, elbow to elbow with the diners next to us, and propped on a high chair. We decided to try the Singapore L'Atelier this time, and fortunately, they were able to sit us late. 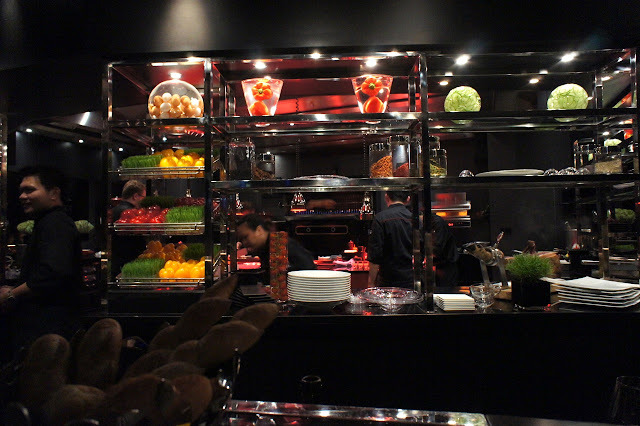 Though in the same location (the Joel Robuchon was located just next door and both restaurants shared a common entrance), the decor and philosophy of L'Atelier was very different. 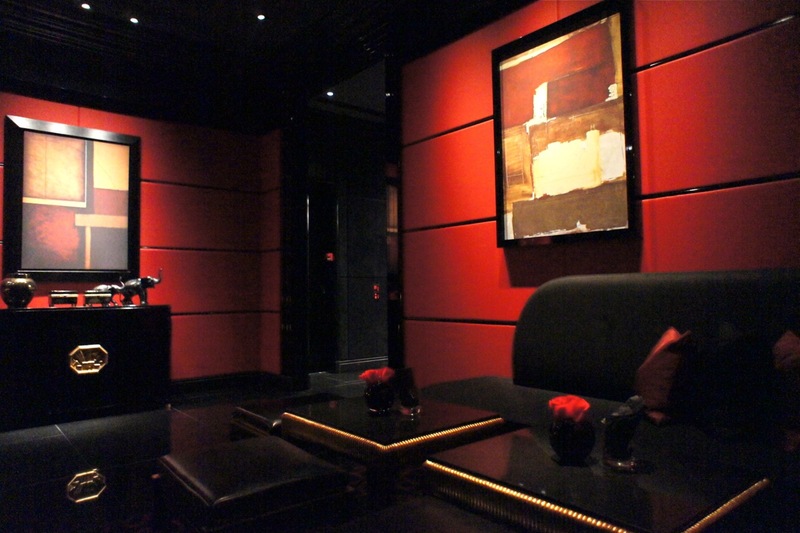 Unlike the opulence of Joel Robuchon, L'Atelier had a more oriental discreet feel with its red walls, dark wood panelling, chinese art and furniture and heavy use of lacquer in and around the room; and this was just the saloon. The main dining room was dominated by a large open concept kitchen and a long bar counter with a few smaller standalone high tables on the other side of the room. The kitchen was set up as as show kitchen and the diners at the counter could watch while having dinner the chefs cooking and preparing every dish right in front of them. This is not a new concept but is one which has been mastered by the L'Ateliers around the world (at least the ones we have been to). Unlike those in Hong Kong and Tokyo, we found that in Singapore, the counter seats were more spacious (it was our perception, we didn't take measurements) and hence more comfortable. The one thing which immediately struck us was how friendly the staff members were. We were greeted with genuine warmth and despite different people serving us over the counter throughout the night, each made the effort to make small talk, discuss the wines and the food and engage in banter with us. 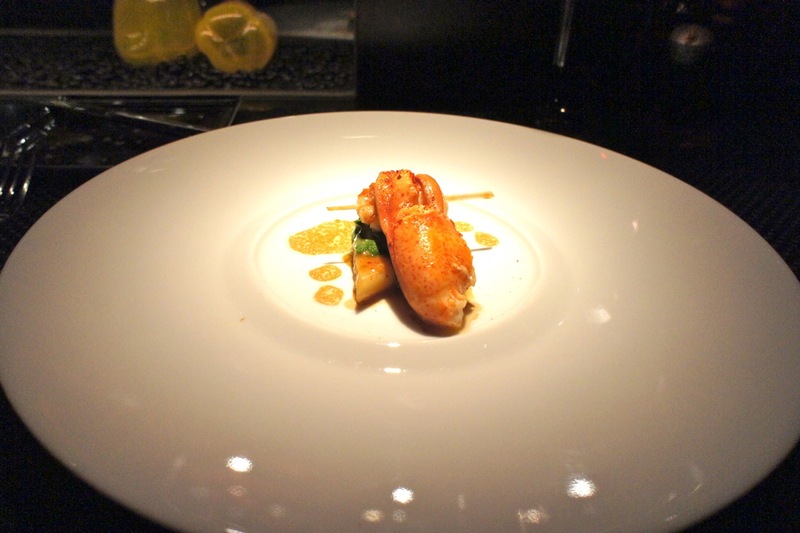 It was perhaps this aspect of the meal which we felt was most superior compared to Hong Kong and Tokyo. We had a glass each of the house Bruno Paillard champagne and ordered a bottle of 2006 Gevrey Chambertin Vieilles Vignes from Vincent Girardin which was reasonably priced. It was quite young though and required at least an hour before it could be drunk. It was a passable Burgundy. 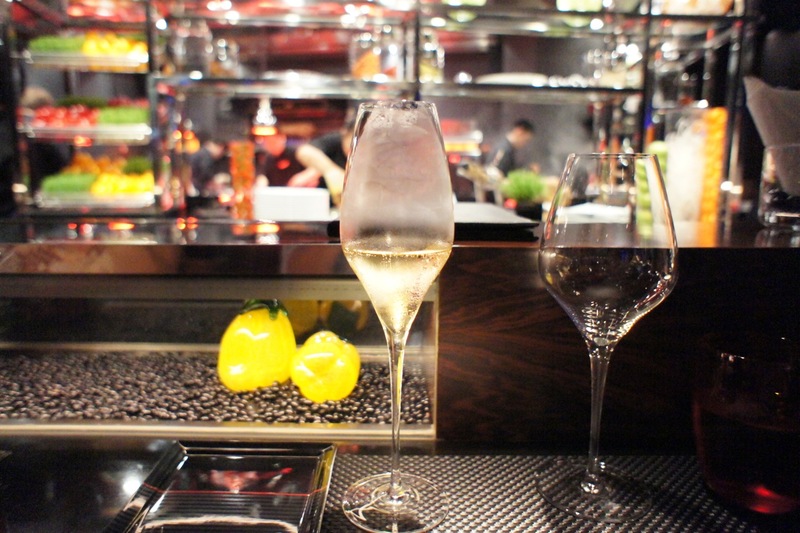 The wine list at L'Atelier, unlike its counterpart in Joel Robuchon, is very short and rather limited. The wines were also very young, but on the flip side, I found the price reasonable. Similarly, the menu was also short and limited. The ala carte menu was printed on one page (excluding desserts) so we opted instead for the Discovery Menu which looked quite good. 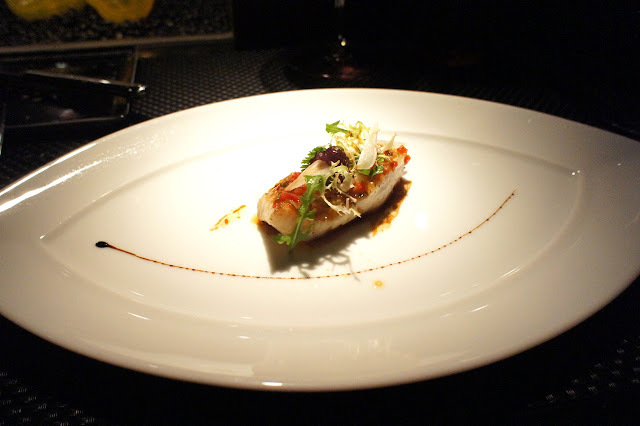 Fortunately, none of the dishes in that menu were those which we had tasted before (we always ended up with at least one repeated dish whenever we dine at a Robuchon restaurant, this time being the exception). 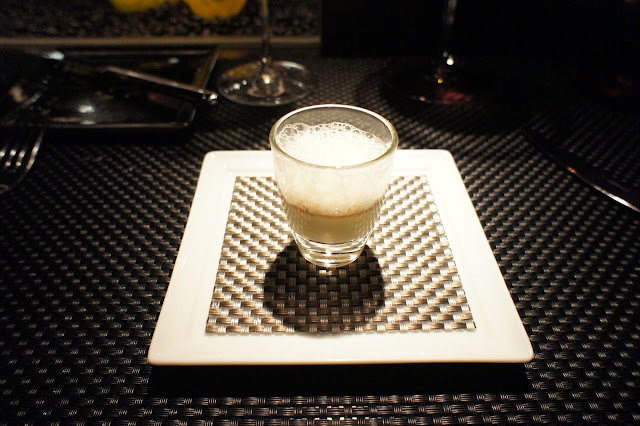 L'Amuse Bouche: foie gras custard with red Porto wine and parmesan foam - This was a favourite. In addition to the above-described ingredients, there was also some pork brine which gave some additional flavour to the taste. Could have this by the bucket-loads. 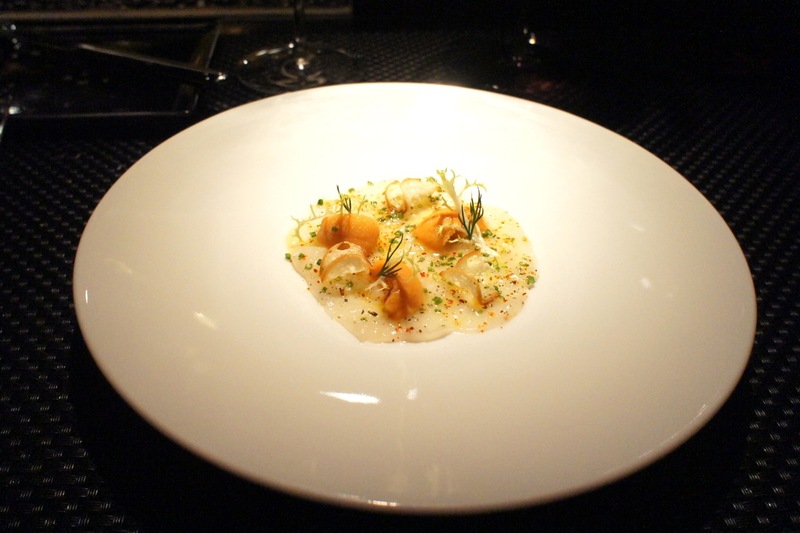 La Saint-Jacques: carpaccio of scallops marinated with raw sea urchin - Fresh and light but if not for the 'French' chili flakes, would be quite tasteless. Interestingly, during this meal there was a frequent use of these chili flakes which would work well in Singapore but would be quite rare to find being used in Europe. Le Homard: seared lobster on a macaroni with wasabi spinach - Another excellent dish, the lobster stock and red wine sauce were very good and the lobster claw cooked to perfection. 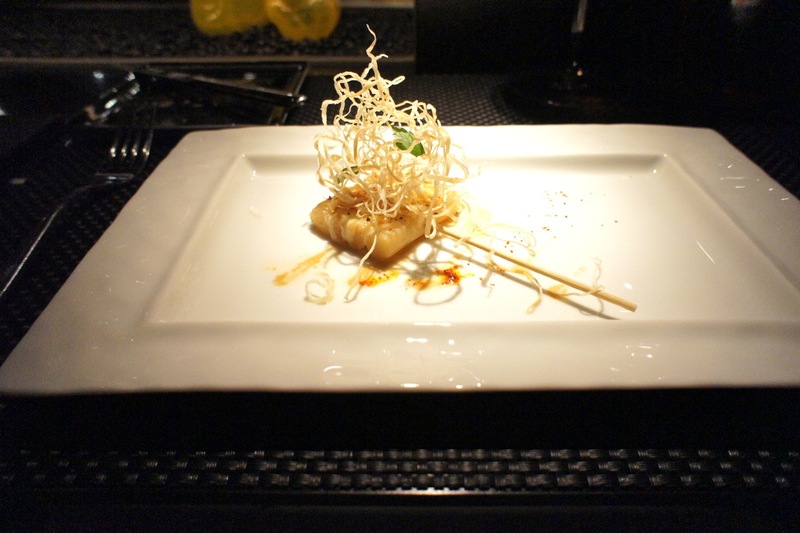 Le Salsifi: salsify confit and fried on a skewer with comte cheese - A light and rather interesting dish. 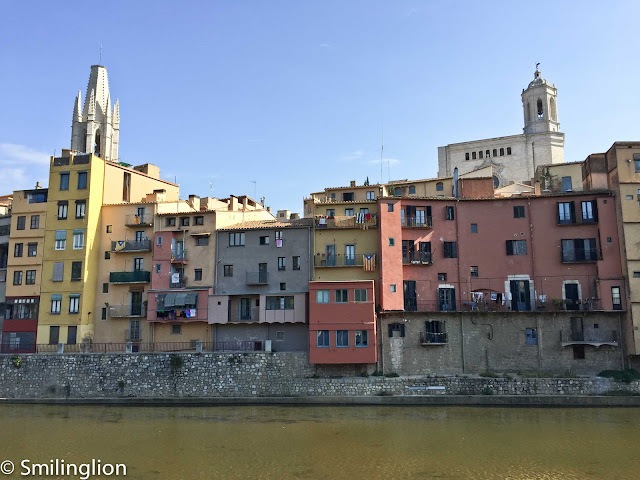 The salsify was a kind of root, and would otherwise be quite tasteless (it reminded me of a cross between asparagus and turnip) if not for the delicious melted comte cheese covering it. 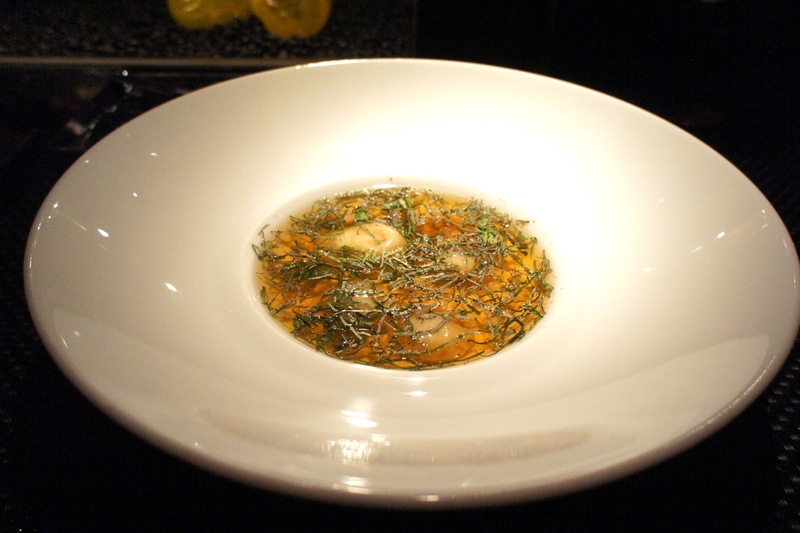 La Poule: chicken broth with foie gras ravioli and fresh herbs - The consommé was superb, though I felt the herbs were sliced too big and numerous and it was like drinking chinese tea and getting the tea leaves in my mouth. The ravioli were small yet delightful complements with the soup. La Barbue: brill with herbs and spring sprouts - This tasted very asian, especially with the use of the chili flakes. It was very well cooked but wasn't the highlight of the evening. Le Boeuf: french-style hanger steak with shallots - This onglet beef steak was very traditionally done. Despite the chewiness of the steak (which is a feature of that specific cut), it was very flavourful and juicy. 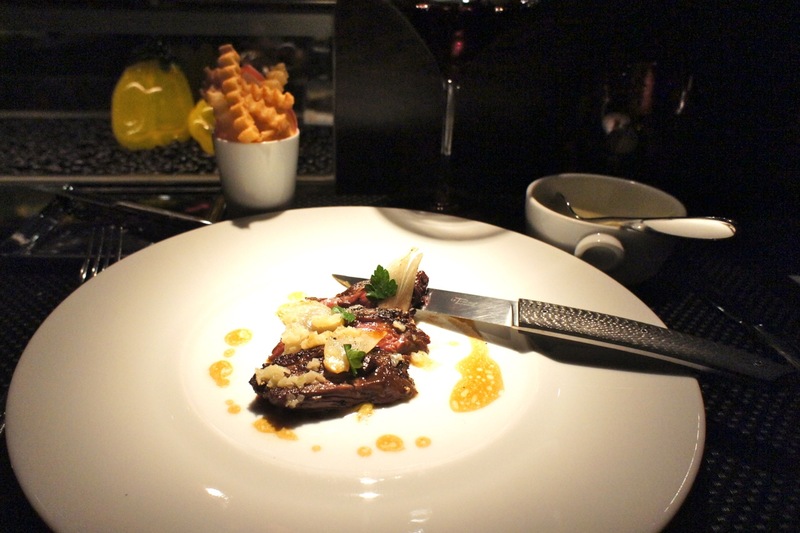 It was accompanied by fries and the Robuchon signature mash potato, both of which were very enjoyable. The kitchen was very generous and would willingly give us additional portions of fries and mash potato. L'exotique: exotic flavours on the island and coconut ice cream - Fruity and refreshing, a good palate cleanser to prepare for the heavier desserts to come. 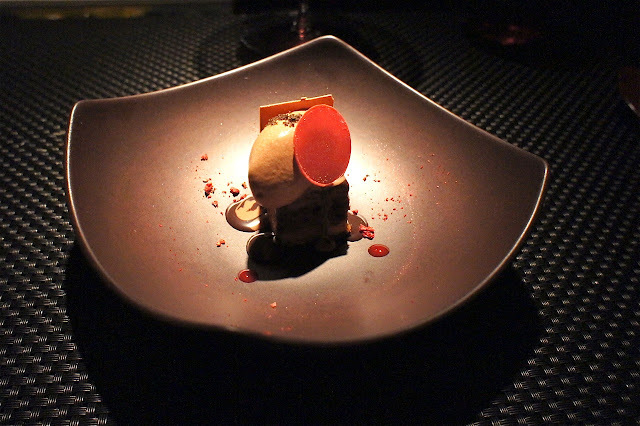 Le Cube: roasted hazelnut dacquoise, creamy Caribbean chocolate - The chocolate dessert with chocolate ice-cream was a french classic but what was really memorable were the tarts which were served as petit four. They were: classic lemon tart, chocolate and macadamia tart, pineapple tart and raspberry tart. 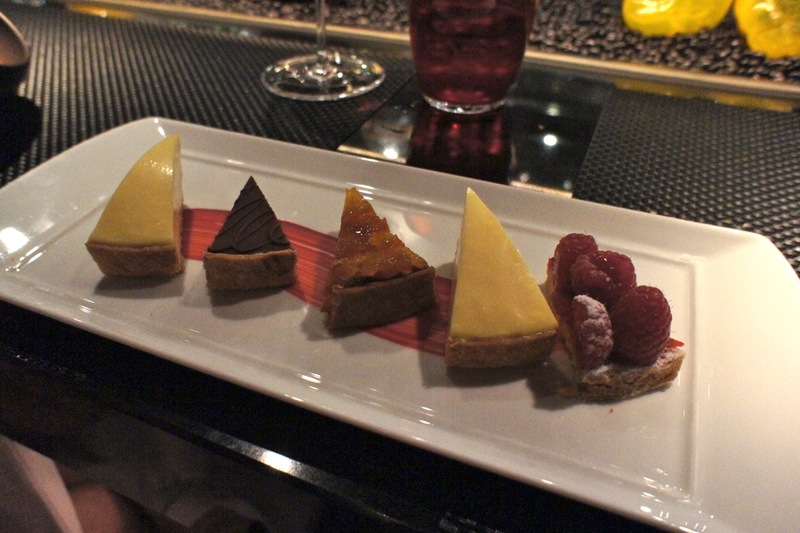 The lemon and chocolate/macadamia tarts were really good. Final Thoughts: A very enjoyable meal. The standard of food and especially the standout service were the highlights of the evening. The staff at the counter were all very slick and personable, being able to engage every diner throughout the meal in French or English. There was a buzz about the restaurant. 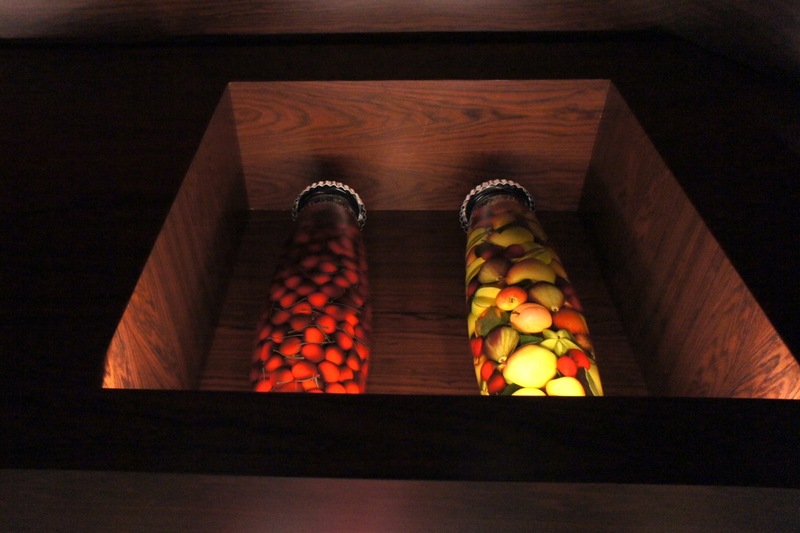 They had a sophisticated clientele and the lighting and decor were chic. The staff members were articulate and urbane and moved around with purpose. This feels better than the L'Atelier at both Hong Kong and Tokyo, and it's comforting to know that the Singapore dining scene has caught up if not exceeded the standards set in those 2 North Asian cities.